NIOD's philosophy behind CAIS departs from 'traditional thinking' in skincare, which is often addressing various existing, specific and visible signs of ageing. CAIS focuses on skin health, placing your skin into a constant state of repair. The star ingredient of CAIS is copper tripeptide-1 (GHK-Cu), which said nothing to me before reading into it. The health functions of copper peptides help in preventing and reversing multiple signs of skin ageing - from elasticity to enlarged pores, sun damage, lines and wrinkles. Unfortunately, the natural concentration of this peptide in human plasma continues to drop as we age. Do I need it / want to put this serum on my face? Uh, YES. A tripeptide is a peptide which consists of three amino acids joined by peptide bounds. Amino acids are biologically important organic compounds - you may have heard of 'essential amino acids' in nutrition or amino acids also used in drugs and cosmetics. In skincare products, amino acids are water-binding ingredients and some act as anti-oxidants. Combined with other ingredients amino acids can fight signs of ageing, aid ingredient penetration and help wound healing. This is the sort of 'repair from within' CAIS aims at. The other peptides in CAIS tripeptide are Proline and Lysine. According to studies (sources below) Lysine is found hydrating and may aid in collagen production. Proline has anti-aging properties and has been shown to improve the appearance of fine lines and wrinkles. In CAIS, these peptides are in a stabilized form and according to their website the concentration is much higher (1.00%) than in other topical anti-ageing products. Personally, I don't know any other skincare products that claim using a copper peptide, but after short googling I found out there are a bunch. 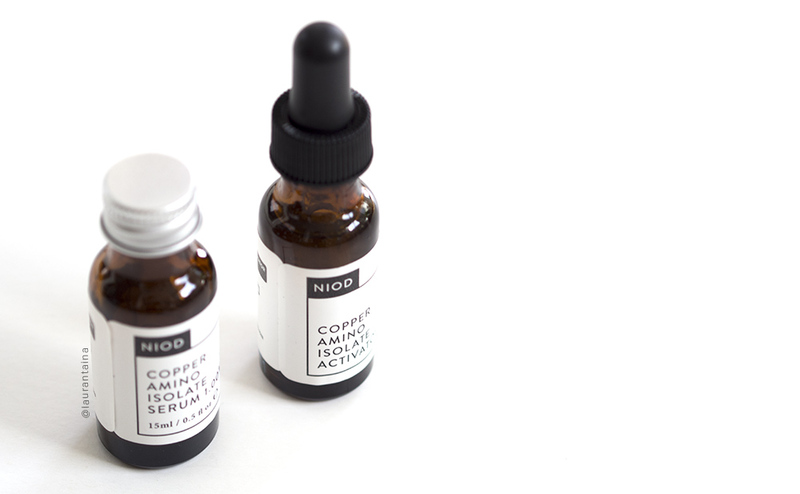 According to some of my sources there isn't enough research demonstrating copper's effects in anti-ageing, but NIOD's claims are definitely promising. The other ingredient in the product is a form of hyaluronic acid, a molecule which your skin loves. It's a natural structural component of the skin, with amazing ability to hold moisture. Hyaluronic acid delivers water to the skin, making it plumper, softer and smoother - which are also qualities of younger-looking skin. Hyaluronic acid must be bioengineered to have a lower molecular weight to penetrate beneath skin surface. Sodium hyaluronate, a salt derived from hyaluronic acid, is a much smaller molecule and also the form CAIS uses. 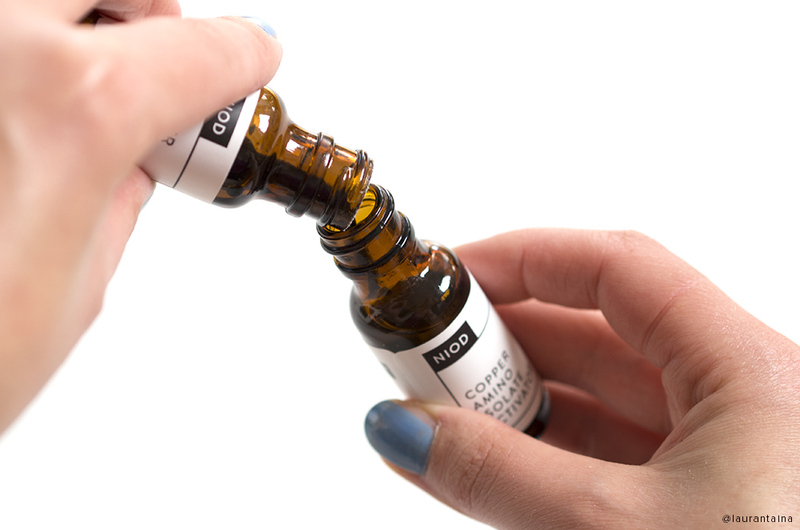 According to NIOD's website, their formula also allows smaller technologies to penetrate the skin. This is exactly what we want - a very-low-molecular form to deliver both water and tripeptides to the low depths of skin. 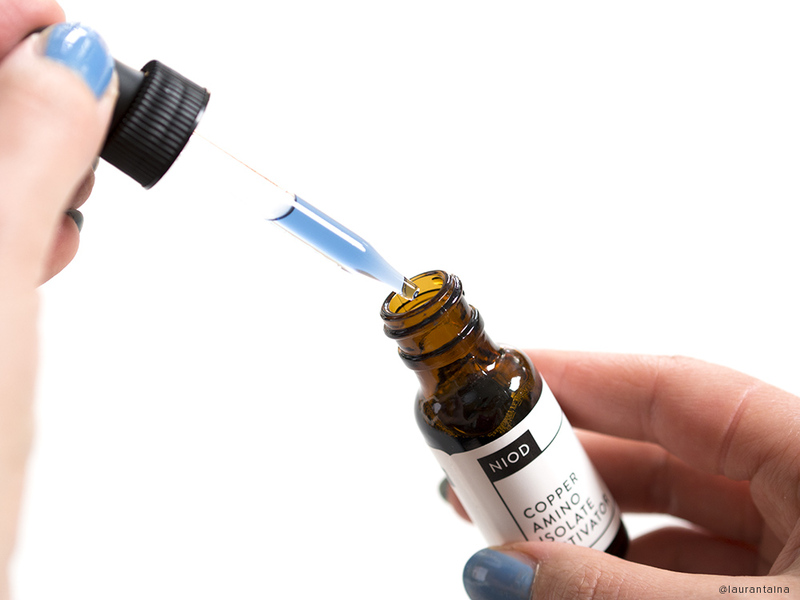 NIOD Copper Amino Isolate Serum 1.00% or CAIS for short comes with a separate activator you dispense into the serum bottle, replace the cape and shake 30 seconds and your ready-to-use serum is created. The activated serum is stabile, doesn't need refrigeration and stays good for about 6 months. The color is gorgeous bright blue, as you see below. Would I prefer a pump over a dropper? Definitely. But am I bothered by it? Not really. I dab the serum on a cleansed skin every morning and evening as my 1st skincare step, followed by an essence, lotion, etc. The serum absorbs into the skin in seconds, there's no residue, but the results kick in slowly over time. I like to give my skincare some time to take an effect, especially before I write these reviews. I don't believe there's one magic product that will change your skin, but a combination of good ingredients with a healthy diet. I'm on my second bottle now and I can't say I can pinpoint any significant changes. I wish I could hype this product and promise you overnight results, but skincare just doesn't work like that. But - my skin looks better, healthy. Having dry and troubled skin I don't say these words lightly. I'd say my skin is balanced and its condition hasn't worsen back to flakey, inflamed mess, which is a big deal to me. My pigmentation issues from acne scars have been healing significantly faster, but there could be a little bit help from my acne medication. Above all, I believe in the science behind CAIS and am very happy how my current skin condition has slowly improved. If CAIS can help me delay more fine lines or wrinkles and continue improving my skin, I'm more than delighted. Would I purchase a third bottle? Yes.